The Euro-Arab Dialogue project was launched in 2001 in Geneva as a framework for inter-regional cooperation among National Commissions to promote the values of ‘learning to live together’. More than a decade on, the situation in the Arab world and beyond has meant that improved cultural understanding and international cooperation is more important than ever. The MBI Al Jaber Foundation joined forces with UNESCO to revitalise and relaunch the project with a series of conferences and technical workshops. High-level international conferences alternate with workshops of technical experts, so that dialogue goes hand in hand with the creation of practical resources. 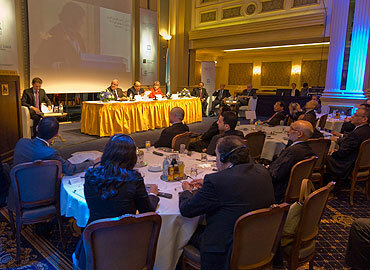 Following a technical meeting in Rabat in 2010 which looked at practical steps forward, an International Conference of National Commissions for UNESCO ‘Euro-Arab Dialogue: Contribution to a New Humanism’ was held in Vienna, Austria in 2012. More than 200 representatives from 67 nations took part, among them Heads of State, Ministers and Diplomats. Over two days, delegates reviewed the work of the past 10 years – and moreover explored how to build upon it. The result was consensus on a clear action plan, targeting ways of developing and enhancing Euro-Arab ties in education, culture, science and communication. The Declaration reached at the Vienna conference in 2012 also resulted in the UNESCO National Commissions meeting with a group of technical experts from educational institutions and NGOs in the Algarve, Portugal, during November 2013. They met with the intention of agreeing a roadmap for the production of an educational toolkit aimed at counteracting stereotyping and promoting tolerance and understanding across Europe and the Arab world. The outcome of this meeting provided for the creation of materials to be made available for educators in schools, clubs and societies in the countries of Europe and the Arab world, to supplement national curricula in the areas of citizenship, dialogue and cultural understanding. The next International Conference is scheduled to take place in Paris in 2016. The Conference will bring together all of those concerned with improving the lives of future generations to form an extensive network for cooperation and action. Participants will include high-level political decision-makers, heads of international and regional organisations, representatives of UNESCO’s networks and partners, and experts and non-governmental organisations who are active in the fields concerned. They will be presenting work accomplished so far and will aim to foster strong Euro-Arab dialogue based on successful experiences, strengthening relations between partners and recommending ways forward. © 2018 MBI International. All rights Reserved.